Some of the face-offs take place among the flowers. Some of the face-offs take place among the flowers. And yes, the dragonfly did come in second in the rush for food. And yes, the dragonfly did come in second in the rush for food. Competition for the food can come from unexpected sources. Competition for the food can come from unexpected sources. It can get a little crowded at the feeders. It can get a little crowded at the feeders. Look at the body language as one attempts to flee the attack. Look at the body language as one attempts to flee the attack. The fight for space at the table can start quickly. The fight for space at the table can start quickly. As quickly as they begin, the fights end as one bird vacates the area. As quickly as they begin, the fights end as one bird vacates the area. One really does need to check over one's shoulder to see what's coming. One really does need to check over one's shoulder to see what's coming. While one drinks, left, two others appear to compete for another seat at the table, even though there are plenty of options. While one drinks, left, two others appear to compete for another seat at the table, even though there are plenty of options. 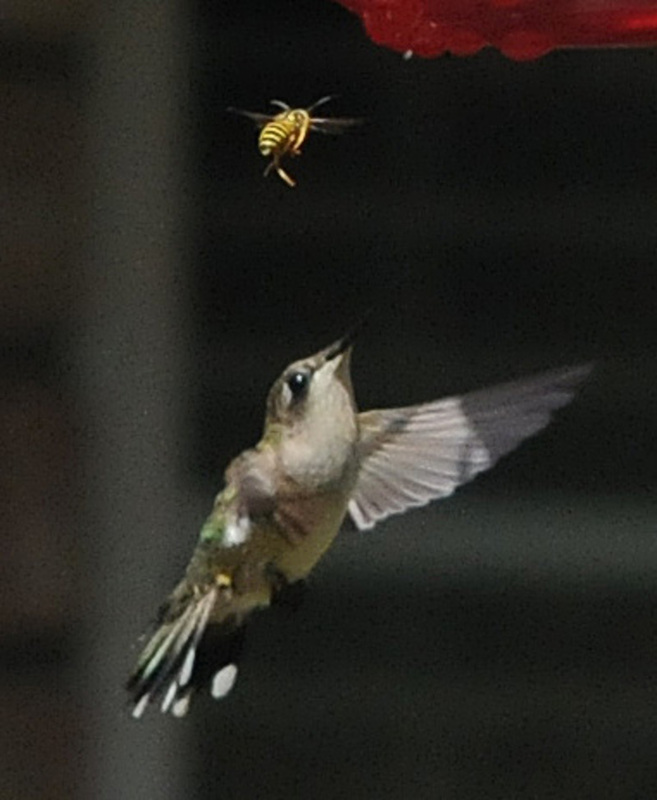 While food is available, right, one hummer chooses to compete with a wasp, left. 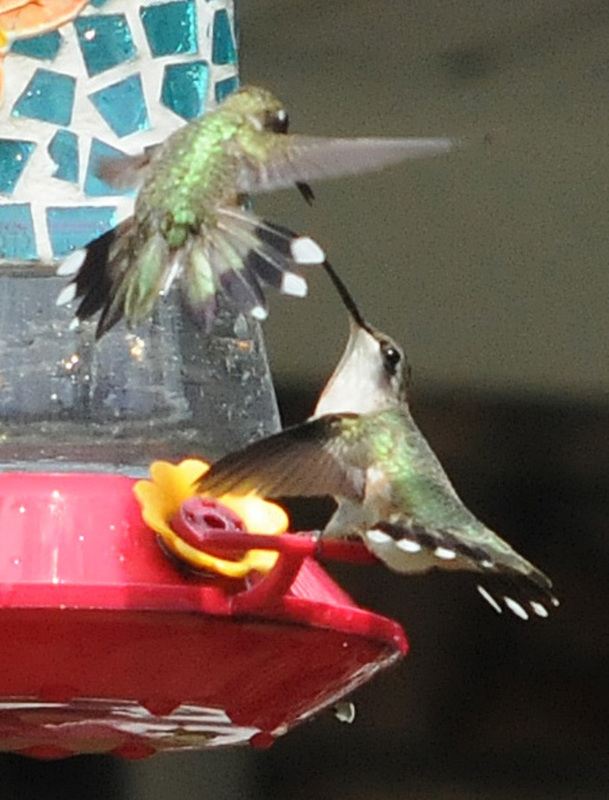 While food is available, right, one hummer chooses to compete with a wasp, left. 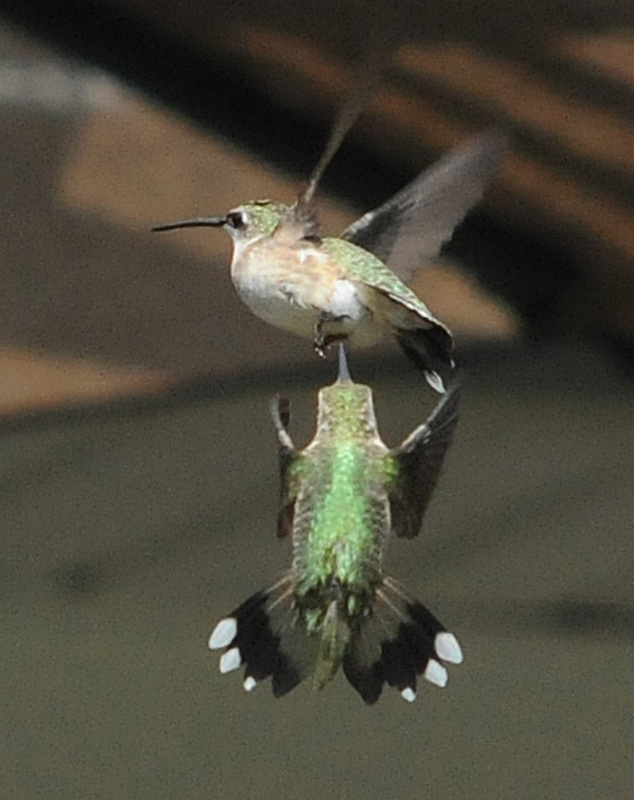 In a split second hummers can go vertical in an effort to escape. 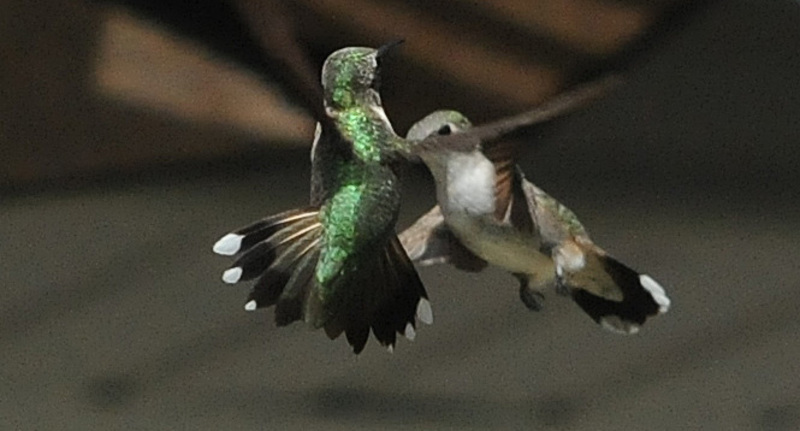 In a split second hummers can go vertical in an effort to escape. 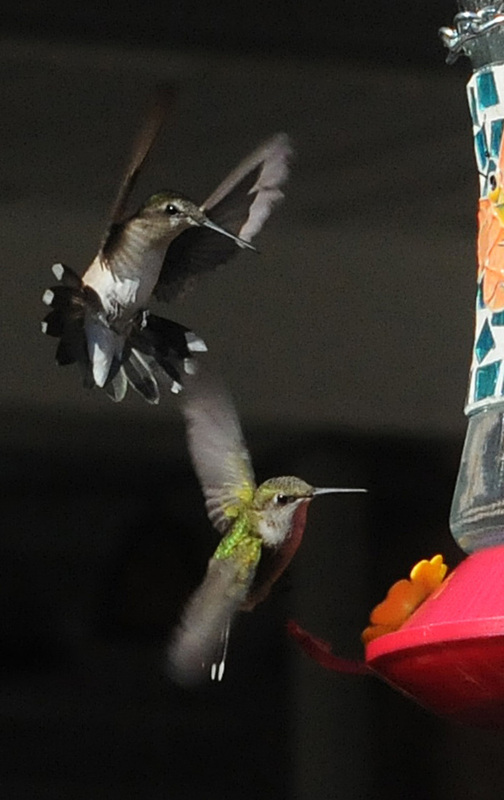 Left, one bird hovers over the feeder while another attempts to drive it away. Left, one bird hovers over the feeder while another attempts to drive it away. While some enjoy a peaceful moment, right, a battle, left, has already gone vertical in a fraction of a second. While some enjoy a peaceful moment, right, a battle, left, has already gone vertical in a fraction of a second. In the race to eat, sometimes the biggest doesn't always get there first. In the race to eat, sometimes the biggest doesn't always get there first. Sometimes the attack actually makes contact. Sometimes the attack actually makes contact. And sometimes they do stand their ground, much to the surprise of the attacker. And sometimes they do stand their ground, much to the surprise of the attacker. 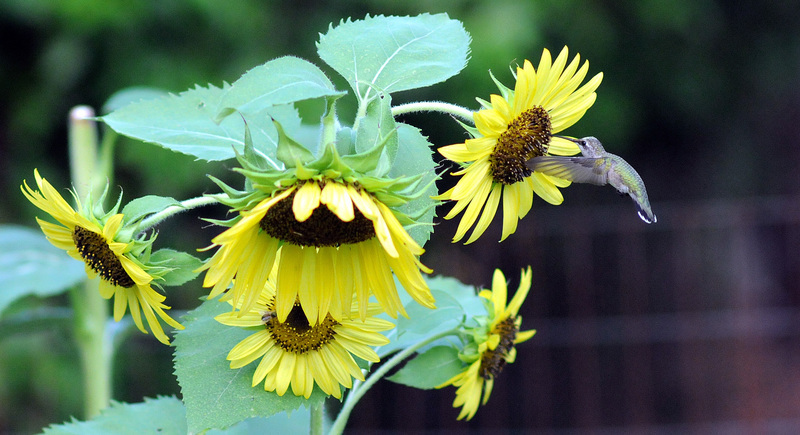 And sometimes, just yards away from the chaos that takes over the feeders, a solitary hummer has the sunflowers all to itself. And sometimes, just yards away from the chaos that takes over the feeders, a solitary hummer has the sunflowers all to itself. 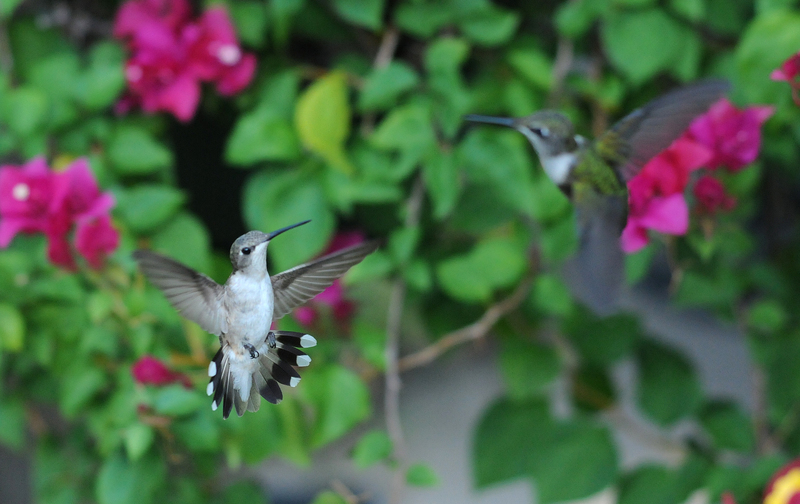 Those tiny little humming birds we enjoy so much turn out to be very competitive, very aggressive and yes extremely interesting. One doesn't have to spend much time watching them before recognizing that they are very willing to battle for their space. Put up a single feeder filled with sugar water and you will more than likely attract a small number of the tiny athletes but put up several feeders and you will soon find yourself with swarms of the birds, competing with one another for their share of the liquid they so covet. One doesn't have to live in the country to enjoy hummers, they tend to find the feeders where ever they are located, though it does seem to help if one puts out the feeders every year. 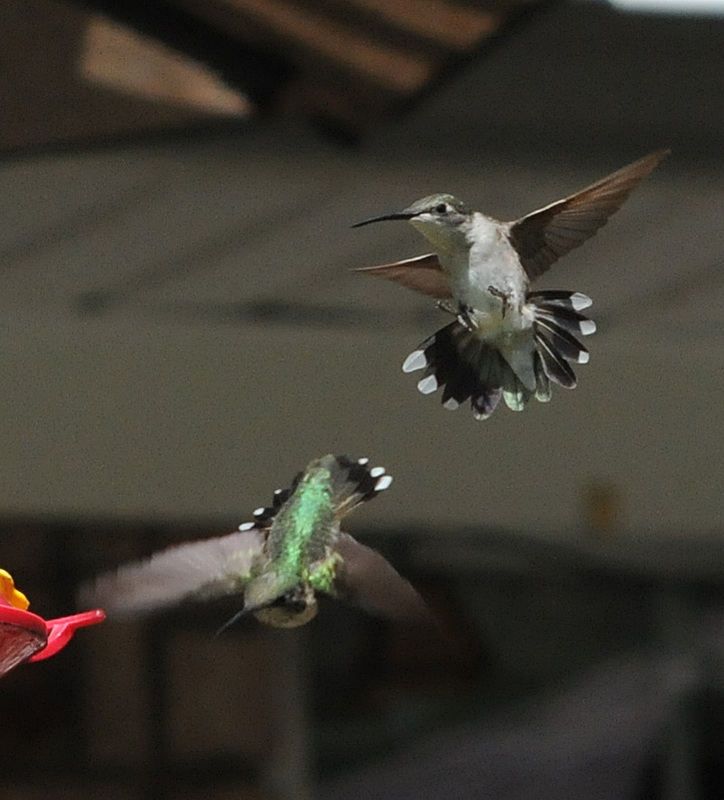 For many East Texas residents nothing is more enjoyable than watching the interaction of hummingbirds as they fend off intruders that range from bees, wasps, butterflies and even other hummingbirds. They hover, dart and dance their way through our life and they fight, though very briefly. It is a mistake to take your eyes off the action as they sometimes battle, twisting and turning with much more dexterity than any fighter aircraft ever had. The competition is fierce and non-stop from early morning to the last minutes of a fading sunlight. Over the years we've learned to make sure the feeders never are empty because once gone, it can take some time to lure them back. We hope you enjoy the pictures and that they might inspire you to take your own.